Hays pitcher Alex Lopez pitched seven scoreless innings as the Larks beat the Liberal Bee Jays 1-0 Friday night in Hays. This was a frustrating evening at Larks Park for the Jays. The Bee Jays hit into five double plays. It was more likely to have an inning when the Bee Jays hit into a double play than not. Liberal’s Darren Cook competed keeping the BJ’s in the game. He went 7 and 1/3 allowing one run. Derek Craft pitched 2/3 scoreless. Hays scored one in the first on three hits. It was an anguishing night for Liberal. An example was the fourth when they struck out looking with the bases loaded and two outs. In the sixth they had first and third and no outs after a Jaron Robinson rocket off the wall and a Cale O’Donnell single. But a strikeout looking and a double play foiled the inning. The Bee Jays led off the eight and ninth innings with singles but hit into double plays both innings. 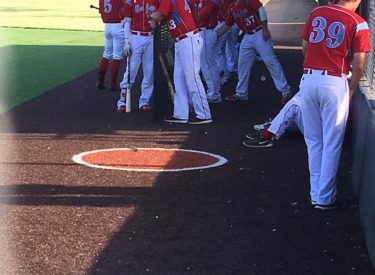 The Bee Jays struck out looking four times which led to the ninth inning objection and then ejection of BJ coach Daniel Parker. Liberal is 3-3 and Hays is 3-1. Same two teams Saturday night at Larks Park at 7 on 1270 and kscbnews.net.